Hello! From what tree are these stumps? Thank you so much Jan! I will contact them. These branches are very difficult to find and are very expensive when you do find them. If anyone else has ever seen them anywhere in the US, please let me know. They are called Liana Vines and they are from Indonesia. If you are still looking for driftwood, try RiverValleyWoods.com - this is my company and I have an amazing variety of gorgeous driftwood pieces. I see others have asked this question, but I haven't seen the answer: who is the maker of the sectional and where can we find it? It is perfect for my needs and wishes. where can I purchase the twisted driftwood in the back corner? Where is the sectional and coffee table from? Where is the sectional from? Love, love, love. Can I get a dining room table like this? Collect oak branches, cut to size, and nail them together. Makes a beautiful base! I would love to know the paint color too...it's beautiful...thanks so much!! it looks like benjamin moore putnam ivory to me. What color paint is on the walls? So soft and pretty. Behr's Wild Honey is similar. Crate and barrel! Just saw yesterday! Green chair - Who makes the green chair? who makes the floor lamp? I would love to know where to find the lamp as well. Where i can purchase those beautiful decorative pillows? I would also like to know where to get the pillows. Who makes the larger sofa? Who makes the larger secional sofa? love the rug, I think someone else asked but did not see reply? - would love to know who makes the rug! Sofa Source - Looking for the source of the sofa in front of the branches (not the chaise sectional). Thank you! I have seen several request paint color...any idea? Love it! Who makes the area rug? Loev the sofa...who makes it? Tree stumps in background? - Where are those from? Where can i buy the cabinet behind the sectional? where can I buy the white tree stumps ? Thanks a bunch !! where are the pilllows from? where can I purchase lianas? I googled and no retailer/source found. thank you. who makes the larger sofa sectional ? I would like to know if this is a two story great room or the height of the ceiling? What are these woodsticks called ? it's not driftwood, and where can we find them ? Driftwood accents add a modern retro cottage shack vibe. The large pieces in the corner look like they are dancing, don't they? The legs and upholstery add just the right amount of mid-century modern to this room. Becky Harris added this to Teal? Seriously? Heck YES! Hints of teal in the accent pieces add to the groovy casual coastal vibe going on in this Amy Lau room. I love this room so much I just had to show it from another angle. It's also a good view of the matching ottoman that goes with the Papa Bear Chair. Keep inspiration from the coast, but tone it down.This cottage has kept a color palette and textures inspired by the coast, but mixed in mid-century modern furnishings. The result is a fresh contemporary look that is still comfortable, with plenty of room for gathering. Debbie Snider added this to Chartreuse: Love It or Hate It? Here it is with a light blue gray. Becky Harris added this to Update That Beachy Style! A similar color palette was used here; mid-century modern furnishings recall groovy beach houses from the '60s and '70s, yet it's all put together in a very polished and sophisticated way. 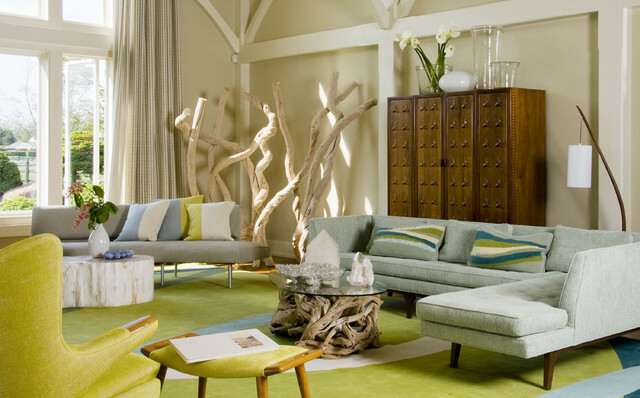 The driftwood coffee table, big sticks in the corner and wavy pillows reference the Hamptons setting in a subtle way. Freeform sculptures give a living room the feel of a natural wonderland. I would love to see the shadows they would make on the walls when used with uplighting. TRADE SHOW — Jan. 26 - 29, 2012IDS12 Interior Design ShowMetro Toronto Convention Centre255 Front St W Toronto, Ontario, CanadaSee what's new in interior design and the latest in design products at Canada's largest contemporary design fair. Mingle with design professionals, discover the latest from product exhibitors, attend workshops and meet with other design-savvy consumers and media. Not to miss is the 3rd annual "Conversations in Design" symposium featuring 12 international "Trailblazers and Trendspotters." The symposium will include: Amy Lau (work shown here), Michael Bruno of 1st Dibs, John Edelman of Design Within Reach and others. Imagine this room without the chartreuse rug and chair. A little boring, right? Ground a sculpture. These wonderful driftwood logs enliven this beach house corner. I had this idea to do in Briceno with the wood from the sea. reclaimed. Coffee table-glass for dining room table? Wooden American Sailer Model Sailboat Decoration, 9"